I recently posted a recipe for a Golden Oreo Cheesecake that I’d made with one of the new oreo flavours that have recently been released in the UK. The other new oreo flavour is peanut butter and I promised you I’d also post a recipe with them, well here it is! These decadent no bake Peanut Butter Oreo Truffles are super easy to make, no-bake, and are a peanut butter and oreo lovers dream. 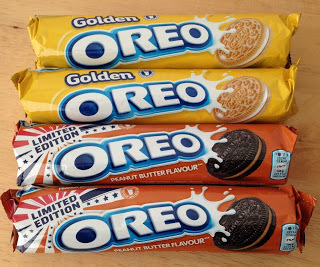 Both Peanut Butter Oreos and Golden Oreos are now widely available in all major UK supermarkets – yay!! 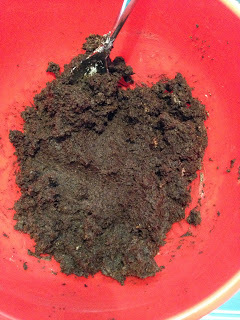 I whizzed up peanut butter oreos in a food processor until they became fine crumbs. 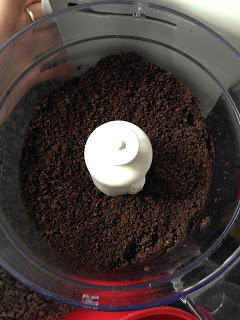 I mixed full fat cream cheese into the oreo crumbs until fully combined. Then I took bits of the mixture and rolled them into balls between my palms. The mixture was a little sticky but easy enough to work with. 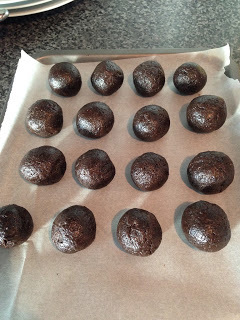 I put the balls onto a lined baking tray and put them in the freezer for an hour. 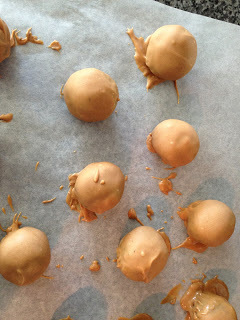 To cover the truffles I used peanut butter flavour candy melts. 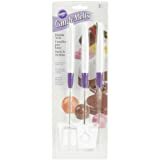 I’d never used candy melt before and when they melt they are quite a lot thicker than chocolate. To thin them down I used oil. This gives it the same consistency as chocolate and it’s so much easier to dip. 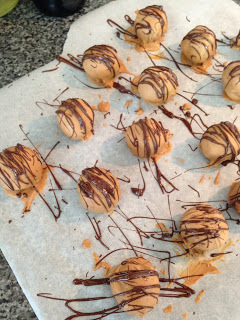 For decoration I melted dark chocolate and drizzled it over the Peanut Butter Oreo Truffles. Once the chocolate is set, dig in! I told you these were a super easy treat to make. 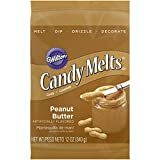 The peanut butter flavour of both the candy melts and oreos is sooo good! 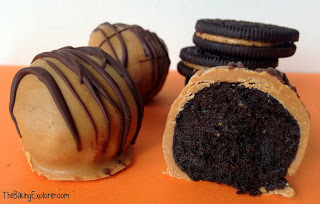 Try not to eat these Peanut Butter Oreo Truffles all at once! Melt the dark chocolate and drizzle it over the truffles, once set they are ready to eat! NB. 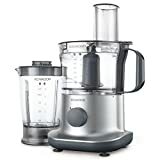 I was sent the oreos for free to bake with, all opinions are my own. You can find more of my Truffle recipes by clicking here! I know what you mean about melts being thicker than you expect. 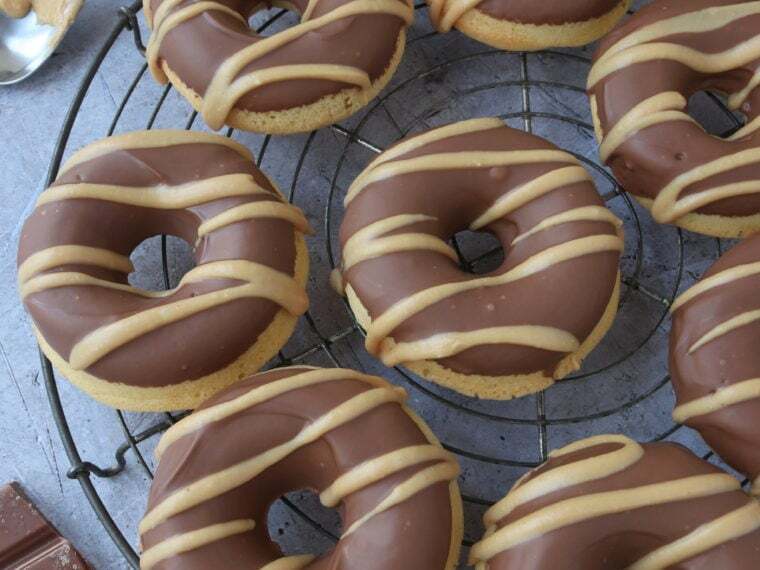 These look fab – I love how peanutty the PB ones are. I was really surprised by it when I first melted them! Was pleased to find a solution. I know – they taste so good!! Yes candy melts can be a little tricky, love the use of the biscuits to form the inside of the truffles must remember that in the future. I think this is a recipe I could try with my young niece, if I could stop her from eating the biscuits and chocolate first! This would be a great recipe to make with your niece! Let me know if you try it!